Notes: I’m reviewing another American made Saison tonight. This one, Surette Provisional Saison, is brewed by Crooked Stave out of Denver, CO. They are best known for Belgian style wild ales. The Brewery advertises itself as “Cultured in yeast…Specializing in 100% Brettanomyces fermentations and barrel-aged sour and wild ales.” From what I understand the head brewer studied Brettanomyces yeast for his Ph.D. I’m generally a big fan of Brett beers so I picked up one of these while in Indianapolis last month. 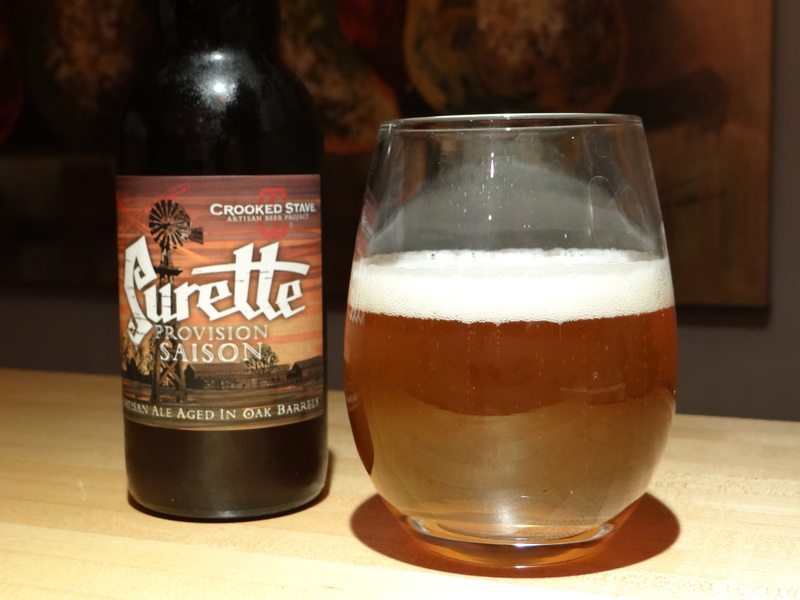 Surette Provisional Saison is a saison aged in Oak Barrels. The beer is a clear golden color with a pretty minimal head (< 1 finger). The smell of the beer is a bit like a dry white wine, accented by acetic acid (vinegar), apples, lemons, and a hint of spiciness and Brett funkiness. When you taste it, the first things that hits the tongue are acetic and citric acids, very tart, green apples and lemon zest in the background. Not surprisingly it finishes super dry and a bit puckering. I think it is best described as something of a cross between a very dry white wine and tart apple cider. It reminds me of Sophie by Goose Island. Well done if you like this style of Saison (high in acetic acid, slightly fruity and very tart), but I prefer Saisons that conjure descriptions like earthy and spicy. My wife Laurinda also sampled this beer. Her notes are more succinct. “Tastes like sour apple juice.” (Editors note – I had to finish her half of the bottle).